In death as he was in life, John S McCain is an American patriot and hero, regardless of what Donald Trump may think or say. 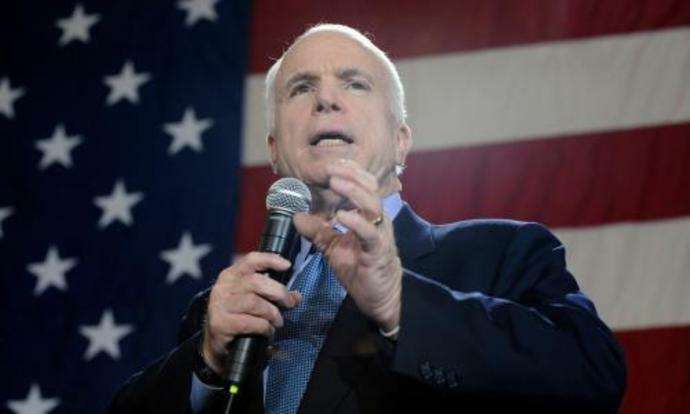 As the Vietnam war raged, McCain was held for five years as a prisoner of war at the so-called Hanoi Hilton. Rather than trade on his family's connections - his father and grandfather served as navy admirals - the young McCain elected to stay with his fellow prisoners, and was brutalized for his sense of duty and honor. While Trump's nonstop effort to mar the late senator's memory should surprise no one, the response of McCain's Republican Senate colleagues to Trump's posthumous onslaught is both telling and disgraceful. The barons of the Senate live in fear of the president and his base. When Trump told Iowans in early 2016 that he could stand on New York's Fifth Avenue "and shoot somebody" and still not lose voters, he knew of what he spoke. Senator Lindsey Graham, McCain's "best friend" and a naval reserve officer, is the most obvious case in point. Graham would only offer up tweeted mush in defense of his one-time "Amigo": "As to @SenJohnMcCain and his devotion to his country: He stepped forward to risk his life for his country, served honorably under difficult circumstances, and was one of the most consequential senators in the history of the body." We are comforted. Later, Graham told reporters, "I think the president's comments about Senator McCain hurt him more than they hurt the legacy of Senator McCain. I'm going to try to continue to help the president." We know you are. Graham continued, "My job is to represent the people of South Carolina. They want me to work with the president where I can. I've gotten to know the president. We have a good working relationship. I like him." In other words, Graham is scared silly of Palmetto State Republicans. The polls tell the story, namely that embrace of Trump is a surefire way to defuse a prospective GOP primary. To illustrate, in 2017 Graham had one of the highest disapproval ratings in his home state of any senator, 40%. By January 2019, Graham's disapproval numbers had dropped to 32%. Playing Trump's hatchet man at the Kavanaugh confirmation clearly paid off for Graham, and with McCain lying soundly in the grave, their friendship could lie there too. Said differently, if Graham could stand idly by as Trump trashed McCain, it was a green light for others to do the same. Take Mitch McConnell, the Senate majority leader. McConnell gushed: "It was a blessing to serve alongside a rare patriot and genuine American hero in the Senate." On the other hand, not a word about the president's posthumous offensive. Ditto the Arizona senator Martha McSally, who filled the vacant Senate seat left by McCain. McSally offered up the same anodyne gruel as McConnell, heaping praise upon the late senator, without mentioning Trump's conduct: "John McCain is an American hero and I am thankful for his life of service and legacy to our country and Arizona." For the record, the names Graham, McConnell and McSally will each appear on the November 2020 ballot. By contrast, two senators who won't be running for re-election are Georgia's Johnny Isakson and Utah's Mitt Romney. Isakson faces the voters in 2022, Romney is newly elected, and their distance from the ballot box showed. Isakson called Trump out by name: "The McCain family deserves better, I don't care if he's president of United States, owns all the real estate in New York, or is building the greatest immigration system in the world." For good measure, Isakson later labeled Trump's comments "deplorable". As for Romney, he posited this rhetorical question: "I can't understand why the president would, once again, disparage a man as exemplary as my friend John McCain: heroic, courageous, patriotic, honorable, self-effacing, self-sacrificing, empathetic, and driven by duty to family, country, and God." No other Senate Republicans have come close to seconding Isakson or Romney. As for decorum, it didn't make a difference in 2016, and don't expect it to make a difference now. The bottom line is that Trump has recast the Republican party in his own image. He embodies and channels the party's core - not McConnell in his banker's shirts. As Trump sees it, and the Senate GOP tacitly acknowledges, without the president the GOP would probably be lost.